McCormick (UK) Ltd based in Haddenham Aylesbury is the global leader in the manufacture, marketing and distribution of spices, seasoning’s and flavours to the entire food industry and have selected UPM Conveyors Ltd to design install and commission a product handling system for all stages of sachet production at a total rate of 120/min from two filling machines through to final cartoning and palletising. Full automation is achieved via a PLC touch screen control with HMI operator interface with all programming and control build supplied in house by UPM allowing ease of liaison with McCormick engineers for fine tuning the system. Sachets from two bag fillers are fed via individual belt conveyors to a Merging Station incorporating sensors for detecting incoming sachets and to energise a pneumatically operated gate to eliminate any product overlap. Sachets are then fed separately at a variable rate to an Equaliser to distribute product evenly in the sachet and then on to metal detection with an automatic reject station prior to being fed via two further belt conveyors having variable speed control for correct alignment to the carton erector and finally to the palletiser. Frank Hentschel of McCormick expressed satisfaction with UPM Conveyors particularly the on site engineers who performed the installation with very minimal disruption and provided an excellent service. The largest meat processing company in Spain invested 5 million Euros in a new packaging line and UPM Conveyors supplied a food tray Switching System to allow product in trays to be automatically diverted to any of four film sealing machines without losing orientation at a rate of 150 per minute. 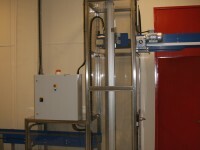 The system is based on four different format belt conveyors mounted vertically on an electrically operated scissor lift to present the required conveyor into position according to the input from the Siemens control which is interfaced to the main process line and all aspects of manufacture were carried out in house including fabrication ; programming and control build to meet IP67 rating. Vertical elevators are used to transport boxes or totes from a lower level to a higher level to avoid doors or to free up production space.